Chinese scholar Li Yi was deported from Taiwan on Friday last week over national security concerns. And since getting back to China, he's been speaking to Chinese media. The contents of a recent interview have caught some in Taiwan off guard. Li said back in 2017, he had done the DPP a favor, by helping the party pass a message on to China's Taiwan Affairs Office. This photo recently posted on social media shows Li at the entrance of the DPP headquarters two years ago. After being deported to China last week, Li told media that several years earlier, he done the DPP a favor by delivering its message to Beijing authorities. In the earlier days, the DPP had approached all cross-strait visits with a willingness to engage in dialogue. No one thought that he would twist our words like this. Also, we are not certain whether Li had been an advocate for using military force against Taiwan at that point in time. Based on my understanding, it was only recently that he started advocating for forceful unification. 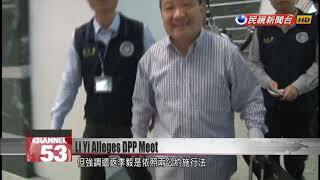 The Mainland Affairs Council said it was unclear on the details of Li’s reported visit to the DPP. It emphasized that his deportation was due to his violation of Taiwan’s act to implement two U.N. covenants on human rights, which prohibit the promotion of war. Advocating for annexing Taiwan through military force is promoting war. It would devastate the lives of people on both sides. He was deported to protect our country’s safety and the welfare of our citizens. The law was implemented based on the circumstances. For the government to do nothing would have been a dereliction of duty. When asked about the alleged meeting between the DPP and the Chinese scholar in 2017, the Mainland Affairs Council said that reporters would have to go to the DPP for answers.